This baby has been doing some serious growing since the last time I saw him when he was just days old. Just look at all of his skills! Sitting all by himself. Crawling to get what he wants. Eating some “solid” foods. And that sweet face is sure to get him out of some trouble if he decides to create some, wouldn’t you say? As a premier Lake Country baby photographer, I adore capturing all of these special milestones. He’s so sweet, I could just eat him up! I’m pretty happy his family decided to sign up for the Grow With Me (Baby) Plan. As a result I get to see him every six or so months for more pictures. Afterall, that first year flies by so fast it would be hard to remember this time without any pictures! Good thing I’ve got your back. Almost all of my newborn clients sign up for this program because they want in on the ground floor for the awesome savings. Three sessions for $100? Yes, please! That’s right! When you’ve held your newborn session with Julie Collins Photography you are eligible to buy into the Grow With Me program for only $100. That’s a tremendous savings in session fees alone and my Baby Planners don’t have to choose between digital images either. They get them all! Read more about it here. You might be thinking…”Oh no! I never had a newborn session with Julie Collins Photography. I missed out on a really great deal!” Not so, my friend! This program is open to anyone who wants milestone images of their baby. The session fees go up to $250 for the three if you didn’t buy in during the newborn reveal. Still an awesome savings at just over $83 each! Enough about that! I have GOT TO talk about this precious little boy and his sweet, sweet family. They recently moved into a beautiful new home across town yet right in the middle of the chaos of moving his momma still made time for pictures! I’ve been keeping dibs on him since his newborn session (like I do for all of my “Baby Planners”) just waiting for him to master the skill of sitting by himself. That’s the milestone I’m looking for to hold that next session. I call it STAGES not AGES. That means that if baby reaches six months old but still isn’t sitting unassisted, we wait until he or she gets that skill. It could take another month. And that’s fine! I’d say this guy mastered it alright. And how do you like that little outfit? It’s one of the most recent additions to my growing wardrobe collection available to parents. 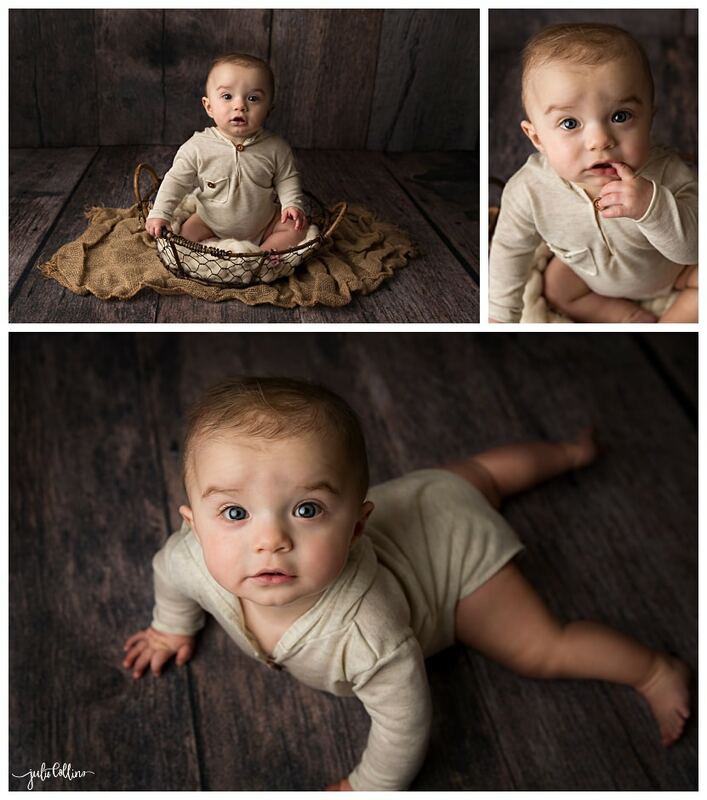 Now his six month images will match the brown tones we used in some of his family’s favorite newborn images. Why is that important? So that your images are cohesive, of course. That way when you put them together (in an album, in a wall collection, framed and next to each other on a shelf) everything looks well designed. See what I mean? I’ve got your back! 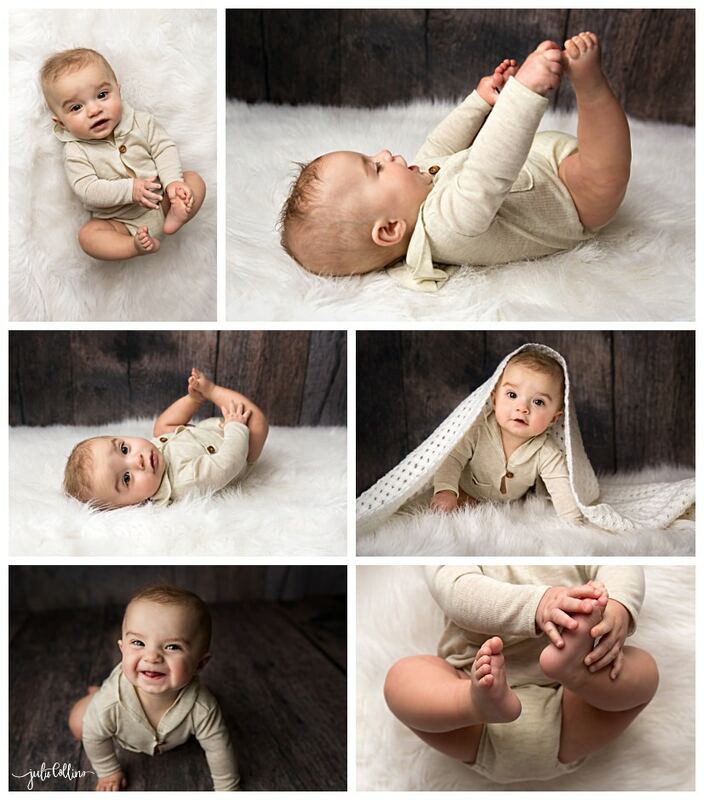 Check out some more from this little guy’s milestone session. Can you tell I love capturing babies playing with their feet? It’s my favorite at this stage. 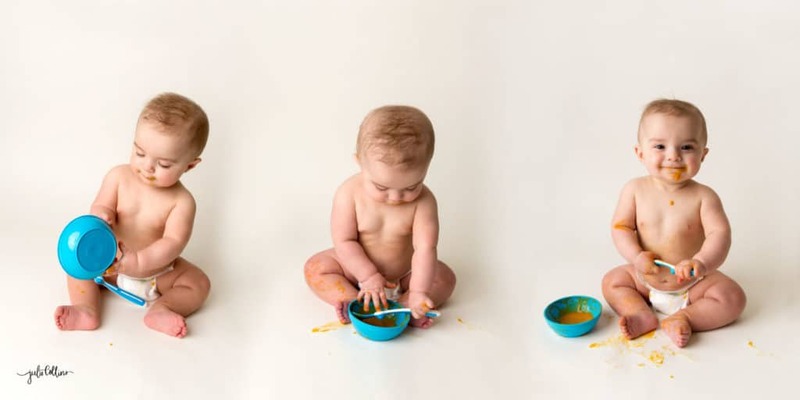 And don’t forget the baby food shots! I always offer these included in the six month milestone session because that’s an important milestone baby is learning at this stage. And well, HELLO CUTENESS! 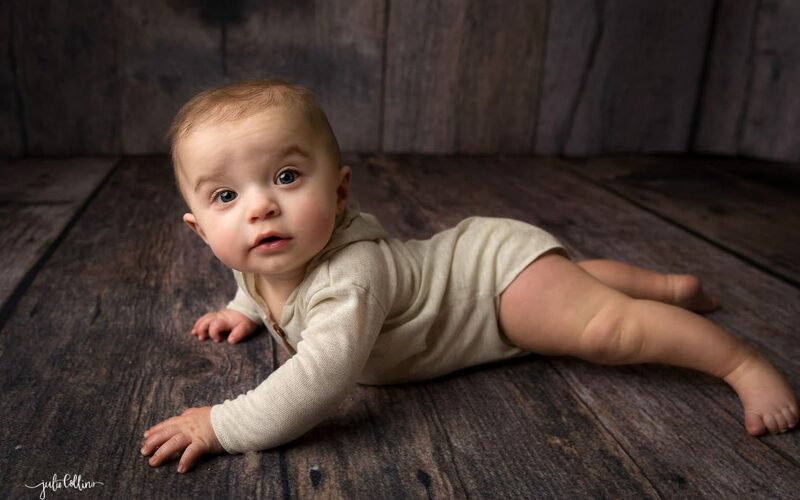 I’m Julie Collins, a premier Lake Country Baby Photographer based in Oconomowoc, Wisconsin and serving Lake Country and the surrounding areas including Brookfield, Waukesha and Milwaukee. I adore capturing all the milestones that come with bringing a baby into the world and occur during their first year. 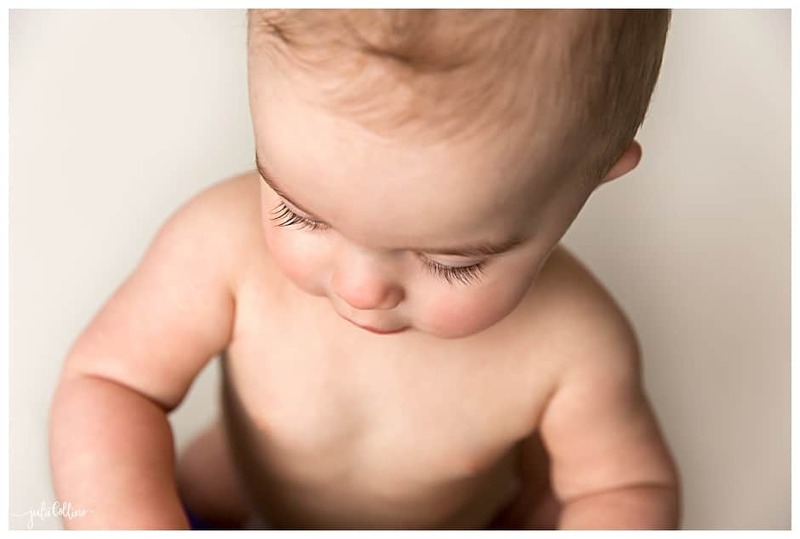 If you’re looking for an Ocoonomowoc newborn photographer, send me a message and let’s chat! What a cutie! This is such a fun age and you captured it beautifully! So adorable! Those lashes! That smile! 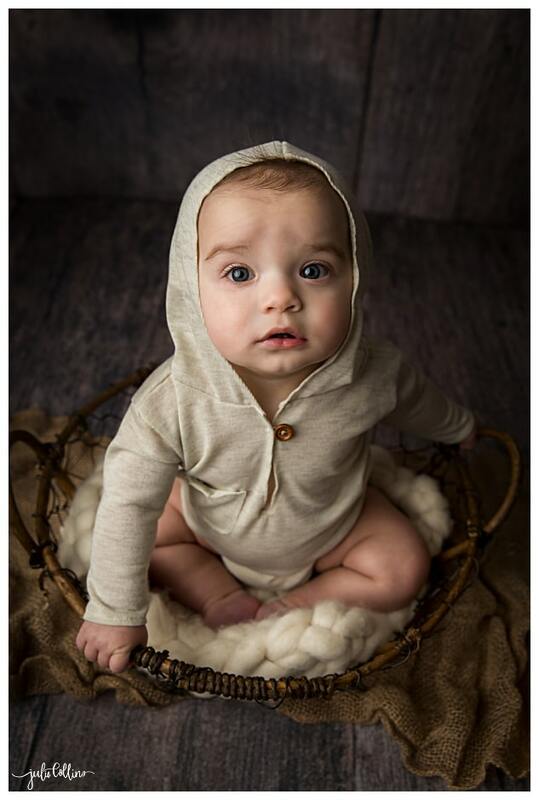 I am in love with how the neutral tones keep the focus on Baby Owen. Oh wow these are adorable! What a cutie! I love milestone sessions! Beautiful images! What a wonderful way to capture those first milestones! 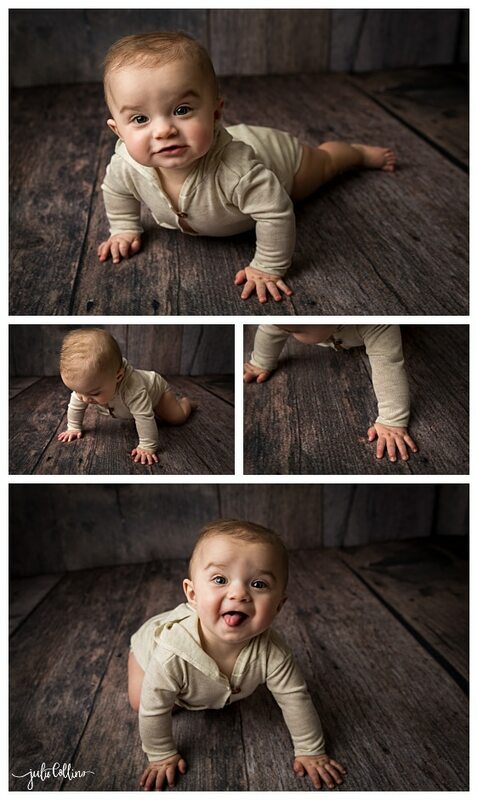 This little man is beyond adorable it was so hard to pick my favorite but I’ll have to say am really drawn to the one he’s crawling, sticking his tongue out and rolling it. he will sure get out of a lot of trouble when he gets there. so cute. Love the work beautiful portraits. Oh my goodness, I don’t think he could be any cuter!